As the name suggests, a bridge is a dental appliance which bridges the gap created by one or more missing teeth. A bridge typically consists of two crowns at both ends with prosthetic teeth in between. The crowns at both ends of the bridge are also known as anchor teeth, as they take support from the natural teeth or dental implants to keep the bridge in place. The artificial teeth in between are known as pontics. Bridges are manufactured using a variety of materials such as porcelain, alloys, and even gold. Traditional fixed bridge: These consist of artificial teeth placed between two or more crowns. The crowns keep the bridge in position, while the artificial teeth are bonded to the crowns. These are the most commonly used bridges and are made of porcelain fused to metal or ceramic. Maryland bonded bridge: This type of bridge is commonly used to replace front teeth. It consists of porcelain fused to metal teeth supported by a metal framework. The bridge has metal wings on each side that are bonded to your natural teeth. 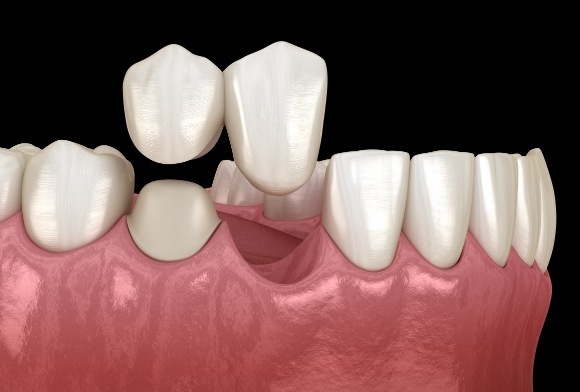 Cantilever bridge: These are used when natural teeth exist only on one side of the missing teeth. During your first visit to our practice to get a dental bridge, we will prepare the anchor teeth for bridge placement by reshaping them to fit dental crowns. Next, we will take impressions of your teeth to design your custom bridge. Meanwhile, a temporary bridge will be placed over the exposed teeth in order to protect them. At your final visit, we will install the permanent bridge and make necessary adjustments to ensure you have a proper fit and comfortable bite. Ready to replace your missing teeth? Contact us today to schedule an appointment to complete your smile.